The Adventure Zone is a biweekly comedy and adventure podcast based loosely upon the popular Dungeons & Dragons game series, along with other role-playing games. The show is distributed by the Maximum Fun network and hosted by brothers Justin, Travis, and Griffin McElroy, and father Clint McElroy. Regular episodes of the podcast feature the family solving puzzles, fighting enemies, and leveling up their characters in a series of cinematic and humorous encounters. 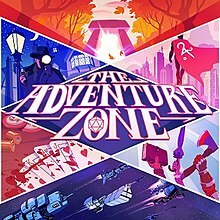 A special episode of the McElroys' flagship podcast My Brother, My Brother and Me called "The Adventure Zone" was released on August 18, 2014. It featured the brothers playing a game of Dungeons & Dragons with their father, Clint. "The Adventure Zone" was later developed into its own podcast on the Maximum Fun network. Griffin McElroy served as the show's primary host and Dungeon Master for the show's first campaign, the Balance Arc. The campaign concluded with episode 69 in August 2017. Following the wrap up of this three-year campaign, the McElroys decided to work on smaller "experimental arcs" in order to give themselves time to work on their next overarching story line. Each of these arcs takes place in their own game worlds separate from those explored in the other campaigns. The second campaign, Commitment, features Clint McElroy as the Game Master. The third campaign, Amnesty, has Griffin returning as game master. The fourth campaign, Dust, features Travis in the role of game master. There are two additional mini-arcs available to Maximum Fun donors. The first is "The Adventure Zone (K)nights," DMed by Travis, which features a steampunk-inspired world containing warring political and religious factions. Lin-Manuel Miranda guest starred in the second of the 2017 bonus episodes. The second is "The Adventure Zone Elementary," in which the group plays a fan-created one-shot RPG entitled "Four Sherlock Holmeses and a Vampire Who is One of the Aforementioned Sherlock Holmeses," which is DMed by Justin. Following Dust, the McElroys announced that Season 2 would continue the story introduced in Amnesty. Advertisements from corporate sponsors and paid messages from listeners, "Jumbotrons," are read by Griffin in the center segment of the program. Fans tweeting about the show using "#thezonecast" may be selected to become the namesakes for various non-player characters in the story lines. This trend has continued with the experimental arcs. During the Balance Arc fans could also suggest items to stock a "Fantasy Costco" for the characters to buy between quests. The Fantasy Costco has been partially revived in the Amnesty Arc to give fans a way to interact with the show. "Déjà Vu" by Mort Garson (from the album Ataraxia: The Unexplained) serves as the primary theme song for The Adventure Zone as well as various interstitials and backing tracks. Griffin McElroy also creates original compositions to enhance the show's production. These compositions are available for listening and purchase on the websites SoundCloud and Bandcamp. A graphic novel adapting the first quest, The Adventure Zone: Here There Be Gerblins, was released in July 2018. The book was written by the McElroys, illustrated by Carey Pietsch, and published by First Second Books. It quickly topped New York Times' best-selling trade fiction list, becoming the first graphic novel to do so. A sequel was teased in the back of the book, which was eventually confirmed and will adapt the second story arc, The Adventure Zone: Murder on the Rockport Limited, to release in 2019 with the same creative team. Here There Be Gerblins (Episodes 1–6) – The introductory quest is loosely based on the Dungeons & Dragons Starter Set adventure Lost Mine of Phandelver, but quickly diverges into the primary plot of the adventure. The party help Merle's cousin Gundren to find and reclaim his family's lost treasures, but instead are dragged into a conspiracy involving powerful magical weapons of mass-destruction, a war no one seems to remember, and the mysterious Bureau of Balance which seeks to keep it all hidden. It centers on the discovery of the Phoenix-Fire Gauntlet, the Grand Relic of evocation. Moonlighting (Episodes 7–9) – A short arc introducing the party to the Bureau of Balance headquarters and the various characters there. Murder on the Rockport Limited (Episodes 10–16) – The party goes to reclaim a relic found by a Bureau operative killed after placing it in an unbreachable vault on the Rockport Limited train. Finding a Rockport staff member murdered on the trip, the party must solve who the murderer is before the train arrives at Neverwinter. During their mission they meet and are aided by the World's Greatest (boy) Detective, Angus McDonald. The party discovers the Oculus, the Grand Relic of illusion. Petals to the Metal (Episodes 18–27) – The party is sent to retrieve the Gaia Sash, the Grand Relic of conjuration. This relic is currently being used by a master thief known only as the Raven. Through a series of events, the party find themselves allied with Hurley, a law enforcer and former lover of the Raven, and taking part in a mostly-illegal death race to claim the relic. The plot for the arc occurred to Griffin while watching Fast Five. The Crystal Kingdom (Episodes 29–39) – A science-fantasy adventure arc focused on the Philosopher's Stone, the Grand Relic aligned around the school of transmutation. The Philosopher's Stone has begun transmuting a floating base into crystal, with lethal consequences for the world below if it is not kept from crashing. The party must navigate the dangers of the crystallizing laboratory, track down rogue Bureau scientist Lucas, and battle with mysterious enemies including crystal golems and undead bounty hunter Kravitz. The plot for the arc occurred to Griffin while watching Alien. The Eleventh Hour (Episodes 41–49) – An arc based around a time-loop mechanic. The party is sent to retrieve the Temporal Chalice, the Grand Relic of Divination, only to find themselves cycling repeatedly through the final hour of a wild-west inspired town beset with a mystery. The Suffering Game (Episodes 51–57) – A darker arc, where the party must go after the Necromancy Grand Relic: the Animus Bell. This relic was discovered by the Director before the Bureau was created. Inspired by the Zero Escape video game series, the group delves into Wonderland, a lethal, mentally taxing, and endless deathtrap which promises whatever participants desire as a prize for surviving, but is quickly revealed to be a trap created by a pair of Liches who feed on suffering. The Stolen Century (Episodes 60–66) – A prequel arc in which the party must rediscover their long forgotten memories and gain better insight into the Hunger, the ultimate foe of all reality. Story and Song (Episodes 67–69) – The climactic finale quest of the Balance Arc, where old friends and former foes join the party to stop the Hunger from consuming the multiverse. An officially produced trailer for the Balance arc was uploaded to YouTube on January 25, 2018. Magnus Burnsides (portrayed by Travis) – A human fighter/rogue armed with a battleaxe. He is an avid lover of animals, a master carpenter, described as "rustically hospitable", and often rushes into situations recklessly. His catchphrase is, "Magnus Rushes In," and his philosophy in life is to "Do Good, Recklessly." Merle Highchurch (portrayed by Clint) – A dwarven cleric armed with a warhammer and an Extreme Teen Bible. Originally designed as a cleric of Marthammor Duin, Clint later switched Merle's allegiance to Pan, god of nature, because the name was easier to remember. Merle has an ex-wife and children. Taako (portrayed by Justin) – An elven wizard with a focus on transmutation. Taako is a former celebrity chef, gay, and usually acts in an aloof manner, despite being arguably the most clever of the three. Justin also voices Garyl, an unflappable Binicorn phantom steed that Taako can summon. Taako's catchphrase is "Taako's good out here." As the Dungeon Master, Griffin portrayed all non-player characters. Notable characters included Lucretia, the Bureau's stony, mysterious director; Killian, a crossbow-wielding orc woman who becomes an early ally of the protagonists in Here There Be Gerblins; Carey Fangbattle, Killian's girlfriend (later wife) and a dragonborn rogue who trains Magnus; Lup, Taako's twin sister (who is transgender); Barry Bluejeans, a denim-clad lich; Johann, a morose bard employed by the Bureau and self-proclaimed greatest musician in the world; Kravitz, a grim reaper employed by the Raven Queen and later Taako's boyfriend; Angus McDonald, the boy detective; Garfield, The Deals Warlock, sinister owner of the Fantasy Costco; Roswell, an armored elemental who serves as deputy of Refuge; and Lucas Miller, a Bureau-affiliated scientist conducting research into the workings of the planar multiverse. The second campaign, and the beginning of a selection of "mini-arcs", was a superhero inspired RPG that does not take any setting or characters from the Balance arc into consideration. The game was run by Clint McElroy with Griffin now taking the role as a player, along with Travis and Justin. As opposed to Dungeons and Dragons, this arc uses the FATE system. The characters all work for the Do Good Fellowship, a "cult adjacent" organization that uses technology and science to improve the world. This arc has a total of four episodes, not including the setup episode the McElroys used to establish their characters, etc. It was notably inspired by the T.H.U.N.D.E.R. Agents series of comics. Irene Baker / Kardala (portrayed by Justin) – A hero partially inspired by Marvel's Thor, Irene Baker works in HR and can transform into the significantly more powerful Kardala, who takes influence from the Inuit goddess Kadlu. Nadiya Jones (portrayed by Travis) – A brilliant scientist of Bangladeshi, English and American heritage who values intelligence over most people. She gains the ability to manipulate her body into shapes and weapons in a similar fashion to the T-1000. Chris "Remy" Rembrandt / Springheel (portrayed by Griffin) – An athlete who failed publicly on American Ninja Warrior, previously working in the Fellowship's IT Department. Remy gains super agility, in particular high jumping. His character was partially inspired by Xavier Woods. Initially the second of the mini-arcs, Amnesty was later announced as season two's full length arc on March 29, 2018. The first five episodes, as part of the mini-arcs, began the series' temporary weekly schedule to get to a full second season more quickly. The Amnesty arc is based on the Monster of the Week system by Evil Hat Productions, and is set in the fictional ski-resort town of Kepler in contemporary West Virginia. Kepler is regularly invaded by eldritch monsters nicknamed "Abominations" from a mysterious otherworld called Sylvain, opposed by a monster-hunting organisation at the titular Amnesty Lodge. Griffin McElroy again takes on the role of game master (called a "Keeper" in the system). While the arc was inspired by monster of the week shows such as Buffy the Vampire Slayer and Supernatural, Griffin says the arc is mostly based on the Persona game series. To replicate the less connected nature of the former's 1990s setting, Kepler is situated in West Virginia's section of the National Radio Quiet Zone. Edmund "Ned" Chicane (portrayed by Clint) – The elderly owner of "The Cryptonomica", a museum and tourist trap showcasing strange creatures and anomalies in Kepler. Ned is a conman and former criminal with a checkered past. Physically, he resembles Brian Blessed. Aubrey Little / The Lady Flame (portrayed by Travis) – A pyrokinetic magician who utilizes a goth aesthetic, is bisexual, and has a New Zealand rabbit named Dr. Harris Bonkers Ph.D. She was inspired by the character Harry Dresden, named after Aubrey Plaza, and based on three of Travis's friends. "Duck" Newton (portrayed by Justin) – One of many chosen ones, Duck attempted to avoid his destiny by retreating into the woods and becoming a forest ranger. Justin also voices Beacon, Duck's magical sentient urumi-esque weapon. Travis McElroy takes the role of master of ceremonies in the fourth campaign, using the Urban Shadows system by Magpie Games. Originally, the arc was envisioned with the making of a custom role-playing game in mind, but the task proved too large for the given time frame. The campaign is set in a fictionalized version of the Wild West, where creatures such as vampires and werewolves live alongside humans, and focuses on feuding families in the town of Dry River. Augustus Parsons (portrayed by Justin) – The deceased industrialist of a successful cashew company who is bound to Earth as a ghost in order to make up for being a terrible person in life. He also has a twelve-year-old daughter named Anna Cardium Parsons. Gandy Dancer (portrayed by Clint) – An Asian-American wizard whose parents were killed when she was an infant. She is terrified of death, studying magic to conquer it. She has a demon assistant/carriage driver named Uncle Oni whose current corporeal form is a Bunraku puppet. Errol Ryehouse (portrayed by Griffin) – An aspiring and well-meaning Latino politician whose dreams of becoming president were dashed when he attempted to cure his lycanthropy, ultimately failing and turning himself into a permanently half-transformed werewolf. Elementary is a two-shot campaign created exclusively for Maximum Fun donors. Using a special game system Four (sometimes five) Sherlock Holmes and a Vampire (Who Is Also One of the Aforementioned Sherlock Holmes), in which Justin (as GM), Travis, Griffin and Clint,(and once guest Patrick Rothfuss) each play as a different version of Sherlock Holmes. Much like Elementary, Fur is a one off made for the Maxfun Drive 2019, the game system used is Honey Heist and Travis is the DM. ^ "MBMBaM: The Adventure Zone". My Brother, My Brother and Me. Maximum Fun. August 18, 2014. Retrieved September 17, 2014. ^ "How Music Helped "The Adventure Zone" Podcast Get Better". The Adventure Zone. Pitchfork. March 27, 2016. Retrieved March 27, 2016. ^ Bailey, Benjamin (December 1, 2016). "Enter The Adventure Zone with a New Graphic Novel Series (Exclusive)". Nerdist. ^ McMillan, Graeme (July 26, 2018). "'Adventure Zone' Graphic Novel Tops New York Times' Trade Fiction Best-Seller List". The Hollywood Reporter. ^ "Carey Pietsch - Comics & Illustration Portfolio". ^ a b "The The Adventure Zone Zone | Maximum Fun". maximumfun.org. Retrieved March 28, 2016. ^ @griffinmcelroy (October 20, 2016). "a lot of folks assumed i was playing Zero Escape games while writing the last arc - they were wrong - It was while I was writing this arc" (Tweet). Retrieved October 21, 2016 – via Twitter. ^ "The Adventure Zone: Balance trailer". Youtube.com. Retrieved February 5, 2018. ^ McElroy, Justin [@JustinMcElroy] (September 25, 2016). "@alixkalaher Taako is officially definitely in-canon gay" (Tweet). Retrieved May 22, 2017 – via Twitter. ^ "The Adventure Zone: Commitment - Episode 1 | Maximum Fun". www.maximumfun.org. Retrieved October 23, 2017. ^ "Setup - The Adventure Zone: Amnesty". www.maximumfun.org. Retrieved January 4, 2018.